Love is complicated, mysterious, and the key to so much of our happiness. The psychic advisors on Keen specialize in love and relationships and use tarot readings, astrology, channeling, and a host of other psychic skills to help you in your journey. Psychics are available 24/7 by phone, chat, or through the Keen mobile app. The site empowers you by helping you answer your most pressing questions—and has hosted more than 35 million conversations. Tools: Tarot, remote viewing, clairvoyant. Reading style: Simple and direct. 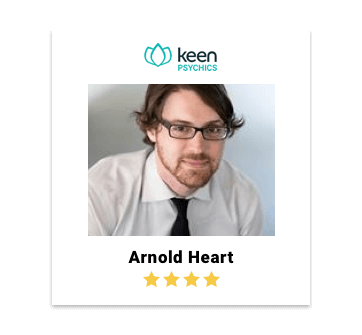 “Oakland4” shared a testimonial after getting a reading from Arnold in June 2018: "Excellent session. He was quick and to the point. I did not have to say much since he picked everything up quickly and I appreciated his honest assessment of my personal and professional life too!" Reding style: Honest and in-depth. 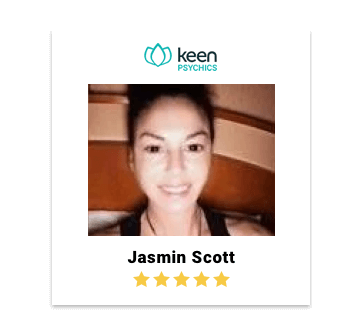 “APD1057” shared a testimonial after getting a reading from Jasmin in October 2018: "Jasmine is truly amazing... with only a name and a birthday she clarified an issue that I've been extremely confused about and in a lot of pain over. I hung up feeling so much relief and perspective. She is easy to talk and has a great sense of humor." Specialties: Breakups, family, past lives. Tools: Empath, Chakra cleansing, medium. Reading style: Direct and assuring. 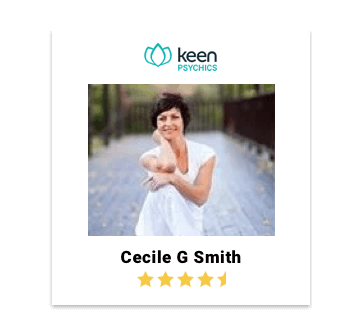 “User819077” shared a testimonial after getting a reading from Cecile in August 2018: "This has been my best reading on Keen so far. She was spot on, and gave a detailed explanation of my situation. 5 Stars!!!" Keen features hundreds of psychic readers, but the screening process is different than many other sites. Prospective psychics contact Keen and are allowed to create their own listing, which can take a matter of minutes. The psychic is then given a toll free number and can start receiving calls and chats. The screening process is done on a sort of crowdsourcing basis. Users can post reviews on psychics and decide which psychics to use based on previous reviews. It’s not as rigid as on other sites, but it allows users to create their own quality control. Keen has hundreds of psychic readers available to give you advice. Readers on Keen have many specialties including love advice, career guidance, tarot cards, and medium. Keen puts a big emphasis on helping people solve the riddles of love. You can find a wide variety of advisors who are well-experienced in dealing with matters of the heart. This can be whether or not a relationship has a future, if your new squeeze is ready to move on, or if your days of being alone are going to end soon. When you’re facing a major junction in life, it can be tough to go it alone. This can be a career change, a move, or any number of big decisions that can be overwhelming. On Keen, you can find advisors who can take a look at what you’re facing, and help you get some peace of mind. A tarot reading is a time-tested way to answer questions about yourself. Though often mistakenly seen as a way of predicting the future, tarot readings actually allow a trained reader to learn about the client and reveal things they maybe didn’t know about themselves. In the office and out in traffic, we tend to think that the material world is all there is. Psychic readers who specialize in the spiritual world, peel back the material layer and give us a window into the spiritual realm that surrounds us. These readings can show a greater meaning to life, in the layers of spirituality that surround us at all times. Nothing can compare to losing a loved one. Beyond the heartache, there’s often the feeling of missed opportunity – all the questions left unasked and all the things we wish we’d said. While you may never find the answers to the questions you never asked, a psychic medium can offer to pass onto the other side and communicate with the ones you’ve lost. Keen hosts psychics specializing in financial advice, numerology, pet psychic readings, Feng Shui, dream interpretation, and a variety of Astrology from Mayan to Chinese. In addition, the site provides answers to Spanish-speaking clients, with “psiquicos” available to help those who prefer their reading in Spanish. Try out Keen with risk-free pricing. You’ll get 3 minutes for free and some psychics offer an initial rate of 10 minutes for $1.99. The site is a collection of independent contractors who charge their own rates. This ranges from as cheap as $1.99 per minute to some psychics who charge as much as $34 per minute. Most advisors charge between $2-$10 per minute. Whichever psychic you contact, know that if you aren’t happy with the reading you can make use of the refund policy, which credits your account (up to $25). You must fill out the relevant support form within 72 hours of the reading and you are limited to only 1 refund or credit every 30 days. Keen uses customer feedback to rank psychics, meaning you’re not just selecting from a list of psychics arbitrarily picked by the website. Instead, you can instantly search the most popular and highly rated psychics in every category and make your selection. You can then be part of the process afterwards by leaving a positive or negative review. If a psychic reader isn’t available, you can take advantage of the callback option. Simply make a callback request and your psychic will call when they are free. Making the request is done by clicking a box next to the psychic’s listing title, which will take you to a menu where you write how long you’re willing to wait. This option keeps you from missing out on a reading and should ensure that if you’ve built up a relationship with a particular reader, you’ll be able to reach them when needed. Keen offers a satisfaction guarantee – though there are some caveats. You have to fill out the request within 72 hours of the psychic session, you can only file one a month, and if approved, you get up to $25 to your account, not cash back. Nonetheless, if you’re testing out different psychics, knowing that you can get the session credited to your account if you aren’t happy should make the decision easier. If you have any questions regarding your account or you’d like some advice about psychic readings, you can find answers to most questions on Keen’s knowledge base or in the blog. You can make use of the customer support form online to file a query, or call customer service during regular business hours (Pacific Time) at 1-877-533-6435. If you’d like to request a refund for a psychic reading, fill out a refund request on a special online form that can be found on Keen’s website. Keen offers a novel approach to psychic reading that sets it apart from much of the competition. Through the use of customer feedback, users are able to determine for themselves which psychics are the best choice for them. This is what makes it in many ways, a user-guided psychic reading website. If you’re looking for answers, with Keen there’s a strong chance you’ve come to the right place.